Anthony J. 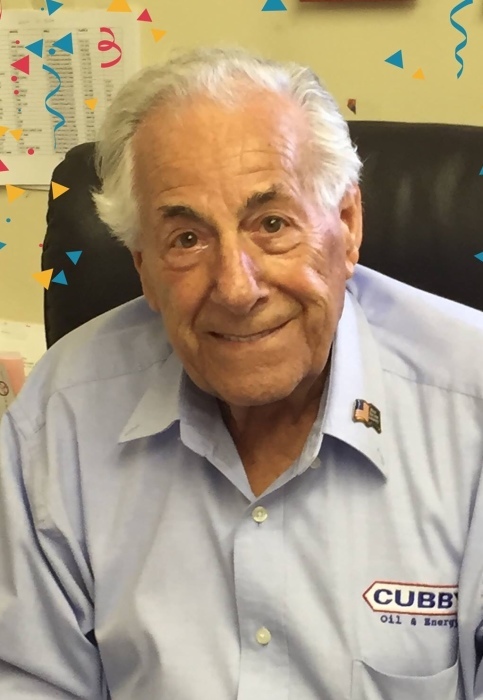 "Tony" Uglietto, founder of Cubby Oil with his brothers in 1945, of Belmont, died suddenly on April 16, 2019. Born in Cambridge on June 20,1923 to the late Pietro and Annunciata (Lecesse). He served in the US Army during WWII in the 3rd Battalion 11th Infantry. Beloved husband of the late Dorothy F. (Campagna). Loving father of Nancy Grignon and her husband Walter, Paula Alden and her husband Charlie, Mary Lucy, Charles and his wife Robin and Elena and her fiance Terry Leahy. Devoted Papa of Charles Anthony, Tony, Ashley, Joe, Jackie, Andrew and Dorothy. Brother of Rose Prizio and Susan Parise and the late Cosmo, Dominic and Salvatore Uglietto, Mary Mancini, Anna Ciampi and Vincenzia DiPerna. Visiting hours in St. Joseph Church 128 Common St. Belmont Monday 4-8PM. Funeral mass on Tuesday at 10:30AM. Relatives and friends kindly invited. Interment Mt. Auburn Cemetery. In lieu of flowers the family would prefer that donations be may made in Tony's memory to Mass General Nurses Fund (giving.massgeneral.org/support-nurses). There's still time to send flowers to the Visitation at the St Joseph Church from 4:00 PM to 8:00 PM on April 22, 2019.